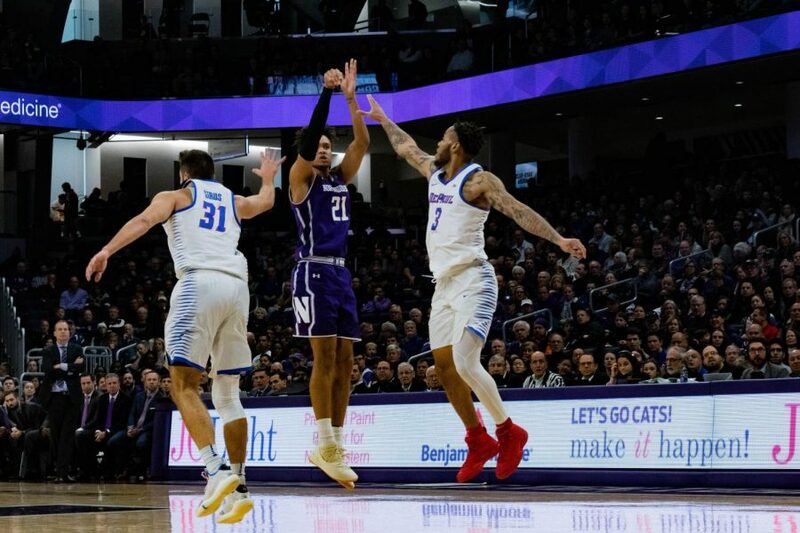 If the last minute of Tuesday’s game against Michigan made it seem that no one on the Wildcats had what it takes to make pivotal shots down the stretch of the game, then several different Northwestern players eased those concerns with one made three after another in the second half against DePaul. After finding themselves in a 15-point hole with ten minutes left, senior forward Vic Law, junior forward A.J. Turner and graduate guard Ryan Taylor each hit several contested shots to give the Wildcats (7-3, 0-2 Big Ten) a lead that grew as large as ten in Saturday’s rivalry game. Law had the final dagger — drawing a foul off a drive and getting to the line with 52 seconds left to expand NU’s lead to five. The Cats earned a 75-68 victory over the Blue Demons (5-1) and avoided losing three consecutive games that went down to the wire. 1. Cats go on a potential season-saving 25-0 run. With just under ten minutes left in the game, junior forward A.J. Turner hit a three that cut NU’s deficit down twelve points. What followed was one of the best stretches the Cats have had in a while. Senior forward Vic Law was effective getting the ball in the post and getting to the basket and ended the game with a team-high 25 points, while graduate guard Ryan Taylor and Turner each hit additional threes to take control of the game. 2. A.J. Turner redeems himself. After the junior forward couldn’t create for himself on the final possession Tuesday against Michigan, Turner had 11 first half points, including three made threes in the first 20 minutes against the Blue Demons. He finished with 24 points on 13 shots, and his spacing was critical for opening the paint up for Pardon. 3. Anthony Gaines shines again defensively. Strus has a very different set of weapons from Michigan forward Ignas Brazdeikis, but for the second straight week, Gaines had a strong defensive presence against one of the better scorers in the country. DePaul’s star guard entered the game averaging 18.8 points per game, and Gaines gave Strus a more difficult time on the perimeter than anyone he’s faced this season, including All-Big Ten caliber defender A.J. Reeves at Penn State. By bodying Strus on drives and attaching himself to Strus’ hip after he set screens, Gaines was able to become the Cats’ best option on Strus. For the second consecutive game, Collins gave Law lesser defensive responsibilities than offensive responsibilities, and after starting the game against DePaul on Strus, Law frequently matched up against another wing, including Jalen Coleman-Lands and Paul Reed. Gaines started the second half and was the primary defender on Strus down the stretch, giving Law the chance to exert himself more on the offensive end. Strus finished with just 8 points on the game. 4. The Strus wasn’t loose, but his teammates were. When DePaul point guard Devin Gage went down for the season in December last year, Strus emerged as one of the most aggressive scorers and fearless shooters in the Big East. He brought the ball up the floor, initiated the offense and sprayed threes from all over the floor. With Gage’s return and the improvement of Eli Cain and Jalen Coleman-Lands, Strus played in a more secondary role against the Cats than he did in is 33 point outing last year. This time he set screens and cut off-ball but still was able to find open spots throughout the game. Graduate center Femi Olujobi had the game of his career and finished with 22 points and 8 rebounds while keeping Pardon out of the post and off the glass. Cain finished with just 7 points, but Gage chipped in 17. 5. Blue Demons double Dererk Pardon. After having two of the most efficient games of his career against Indiana and Michigan last week, the undersized Blue Demons doubled NU’s center in the post throughout the game. DePaul’s graduate center Femi Olujobi has a similar build to Pardon and a low center of gravity, leaving Pardon unable to back him down. Meanwhile, the help the Blue Demons sent made it difficult for Pardon to change directions in the post. The senior center had a 10-8 line against the Blue Demons and took 7 shots. With the win the Cats finished a stretch with seven consecutive games against high- or mid-majors with four wins, and they’ll play Chicago State at home a week from Monday.